a few months ago, a friend asked me if i could help her create a scrapbook for her to give to her father. he's building a new house, and was sending her weekly updates on the progress and she thought of putting them into a book for him. so each week, she's been forwarding these pictures to me and i've created the pages to make it happen. i found two house and home quotes for the cover and title page to add a little depth and interest, and then kept the rest of pages fairly simple. some weeks there were lots of pictures, others less, but since the book was about the progress seen in those pictures, i wanted them to be the focus. i picked a font and color and created a title template that i followed each week. with the title going up the right hand side, i had plenty of space left to place the pictures. working digitally allowed me to re-size as needed and fit the different shaped pictures together like a puzzle. a little creative cutting and pasting helped me add a "new" close up shot for the couple of pages where i didn't have enough pictures to fill the page. each page is slightly different depending on the quantity and sizes of that week's photos, but the overall look is the same. and all together, they tell the story perfectly. the first time i printed the small piece for the cover, it was too big--i measured the slot not the window opening! but the misprint was the perfect size for a card, so i couldn't just throw it away. the book was a birthday present, and every present deserves a card, right?! when time or money is short, it makes sense to email an invitation. technology definitely delivers faster and cheaper, but it doesn't mean that you have to skip the traditional form. time was running out for this birthday girl, so an email invite was the perfect answer. i created it like i would any other, with two differences. one, i wasn't limited to a specific envelope size, and two, i converted it to a jpeg that can be emailed. most email programs display jpegs right in the message, so the invite is immediately seen & enjoyed, others may require you to click to view. either way, you have the personality of a paper invite with the speed and cost free delivery of email--win, win! on a design note, this was a really fun invitation to create. a track meet photo of the birthday girl offered the perfect head out of the window, hair in the wind shot to add a personal touch to her stretch ride! so posting every day right away was a little ambitious! yesterday ended up being pretty hectic, but i'm back today with a card from the new craft critique article i was working on. the article is part of a vendor spotlight on kitschy digitals by danielle thompson. kitschy digitals offers "digital kits, paper goods & embroidery patterns for the kitsch-lover in you." really cute, fun images and papers that you can use in digital layouts, or print and use on other projects. and since it's digital, you can do all that as many times as you want. the soft serve and green bubble talk paper in this card are two of my faves, especially when paired with "you make life sweet" from a muse. bright, kitschy fun! click here to read my article and see more cute pics and here to look through the whole vendor spotlight--and be sure to leave a comment over there for a chance at free kitschy digi fun! if you've ever wanted to try digital scrapping or designing, these kits would be a fun way to start. i've been tagged twice--thank you kristina lewis and also sarah moore, my fellow craft critique-r! 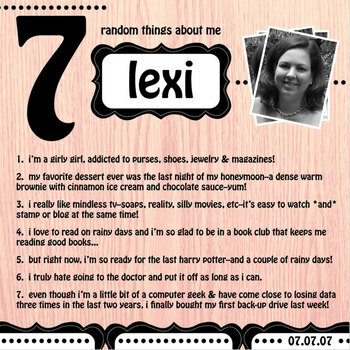 although i've done 7 facts about myself once before, this one said 7 "random" facts, so i thought i'd play again--especially on this day, the 7th day of the 7th month of the 7th year of the millenium! and because i wanted to play with some new digi buys, i digiscrapped 'em. i hope they're random enough! if you can't read it (and you want to!) click the photo for a bigger pic and please remember, i'm still learning! p.s. 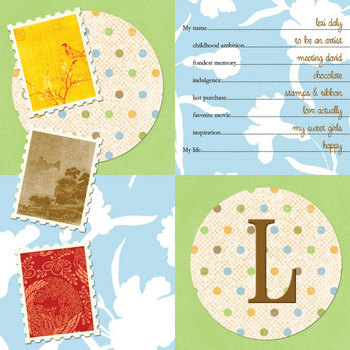 the pretty woods paper and swank label are little pretty studio by jennifer pebbles, the font (including the dots) is hobo. ETA: i forgot to say that i really don't know who to tag, so if you want to play consider yourself tagged and let me know so i can go read about you too! one ~ we are the fish! i didn't get to stamp today--in fact, i was barely home! it was all about going to the zoo and playing in the fountain on monkey hill; built, as the story goes, to show kids in new orleans what a hill was and commonly referred to as the highest point in the city. from there, we made a quick change of bathing suits and raced off to the first sunfish swim meet of the summer. so in honor of that, i thought i'd post two of my very first digiscrap designs from last year. i have yet to really get into this craft and certainly don't create cutting edge layouts--remember, these are two of my first! but i do love being able to create using only my computer, resizing and shaping my digital pictures without the waste of printing, cropping, etc. it's also easy to make a slide show of layouts or print multiple copies of the same design. this was particularly useful when i created an 8 x 8 scrapbook for one of mignon's friends who moved away and also printed a copy for us keep as well. i'd love to get more into this type of scrapping, but cards and invitations always come first!